Wait, here I am! Always late to the party. Actually, if it were a literal party, I would be right on time. I think that’s a Southern trait. However, the party I am referring to is the tomato celebration in our East Nashville neighborhood. I am not a big festival goer so I don’t always make it there in person but The Tomato Art Festival has made our neighborhood famous. We do have some of the best tomatoes in these parts. I love that. My friend Melissa over at Corbin in the Dell won first place and second place in the bruschetta recipe contest at the festival for her yummy recipes! I feel so lucky that she lives right around the corner and I got to sample one of the winning recipes, HO’ Chetta (made with hoe cakes instead of bread and mostly ingredients from her backyard garden), the night before. DELICIOUS! 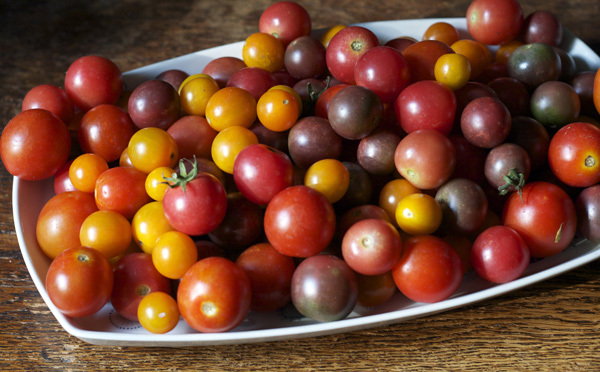 This first recipe seemed a good way to use the late summer tomatoes that aren’t quite as delicious as the early summer ones. I just love roasted tomatoes. They add so much flavor and excitement to many different dishes. I throw them in everything. 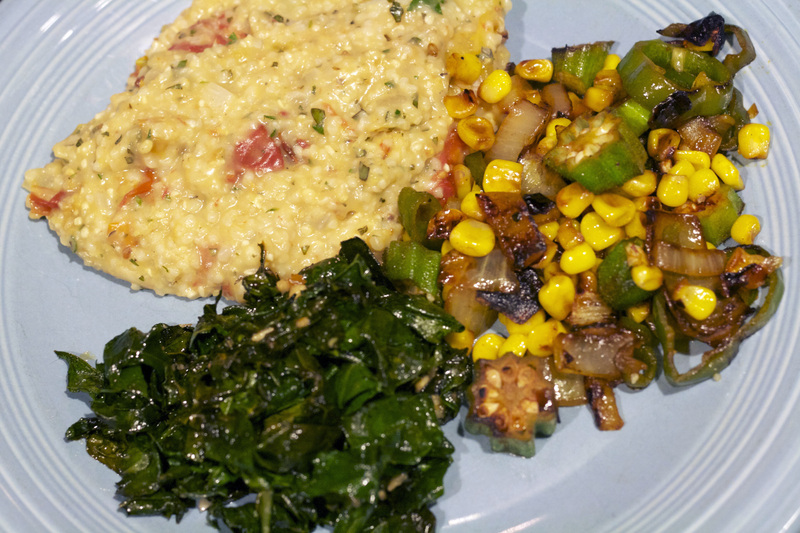 I served these Roasted Tomato Grits with some sauteed mixed vegetables from the garden (peppers, onions, okra, and corn) seasoned with smoked paprika and some sauteed kale with a tiny bit of shoyu (or tamari or soy sauce) and then garlic and quince paste thrown in at the end. Preheat oven to 400 degrees. Slice small tomatoes in half and larger tomatoes in 1” chunks. 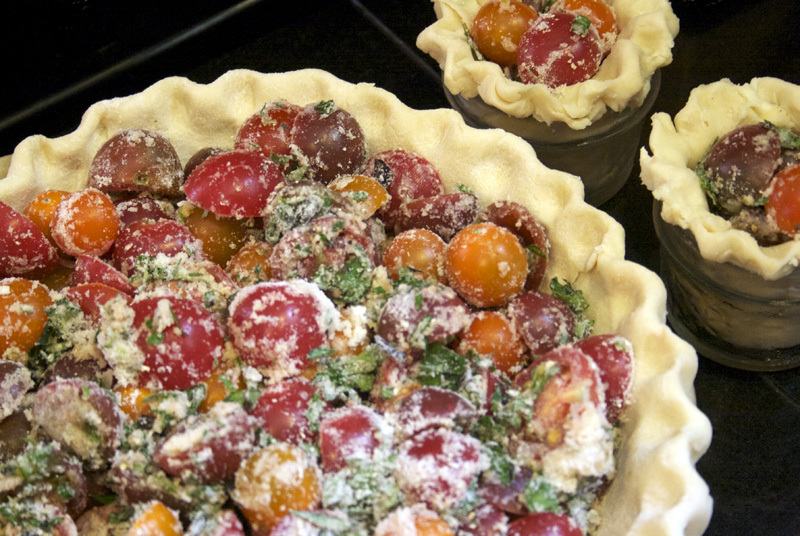 Place tomatoes in an oven safe baking dish. Drizzle with olive oil. Roast until they are nice and caramelized but be sure to stir occasionally so they don’t stick or get too dry. Once the tomatoes are out of the oven and a little cooled, chop them a little more. Meanwhile, heat saucepan on medium and add butter. Once the butter begins to brown, add the onion. Cook until translucent. Add the grits and stir. Add the water. Reduce heat to a simmer. Stir occasionally so grits do not stick to bottom of pan. Once most of the water has been absorbed and the grits are thicker, add the buttermilk. Stir. Cook for a few more minutes until the grits are the consistency you like. Add the cheese. Stir. Add the tomatoes and fresh herbs and stir. Salt and pepper to taste. 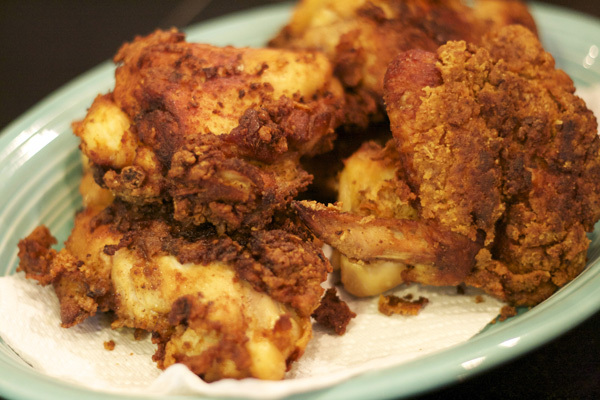 I had a birthday a few weeks ago so Grant made me one of my favorites, Fried Chicken with Tomato Gravy. Well it was delicious. 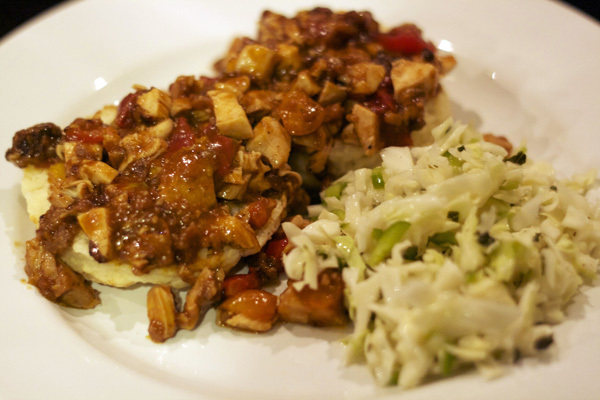 We enjoyed it with a Basil Cole Slaw that Grant came up with on the spot. (That’s right, we still have plenty of basil!) Here is his recipe. Chop the cabbage finely. 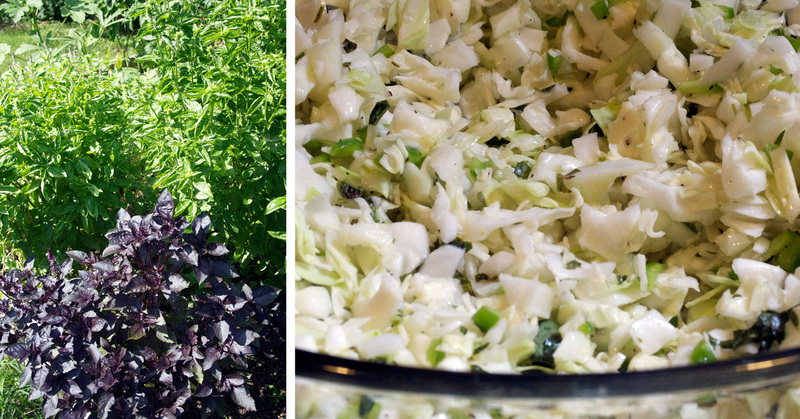 Chop the fresh herbs and mix with the cabbage in a big bowl. In a small bowl whisk together the remaining ingredients to form a dressing. Pour the dressing over the cabbage mixture. Stir well. Let sit for at least half an hour. Serve. We made the leftover Fried Chicken and Tomato Gravy into a sort of hash and served that over homemade biscuits with the slaw on the side. I love when leftovers can be reinvented! Preheat oven to 450 degrees. Mix the salt and baking powder with the flour and then add the chilled butter in a medium mixing bowl. Work the butter into the flour with your fingertips until the butter pieces are a little larger than an English pea, but not larger than a lima bean. Work quickly so that the heat of your hands won’t melt the butter. Pour in all of the buttermilk and, using light pressure, fold the mixture a few times until it holds together. Don’t overmix. In order to make light biscuits, it is important to work the dough as little as possible. Turn the dough out onto a floured board and fold it quickly and gently 4-6 times, just enough to get all the ingredients mixed. Sprinkle a little flour under the dough so that it won’t stick to the board and lightly dust the top of the dough so that it won’t stick to the rolling pin. Roll the dough out to about ½” thickness. Cut the dough into 2-inch rounds, place on an ungreased baking sheet, and bake in the preheated oven for about 11-12 minutes. I like the biscuits to be crispy and brown on the top and bottom, but not dry in the middle. Listening to the Opry on WSM now. You can, too, every Friday and Saturday night. 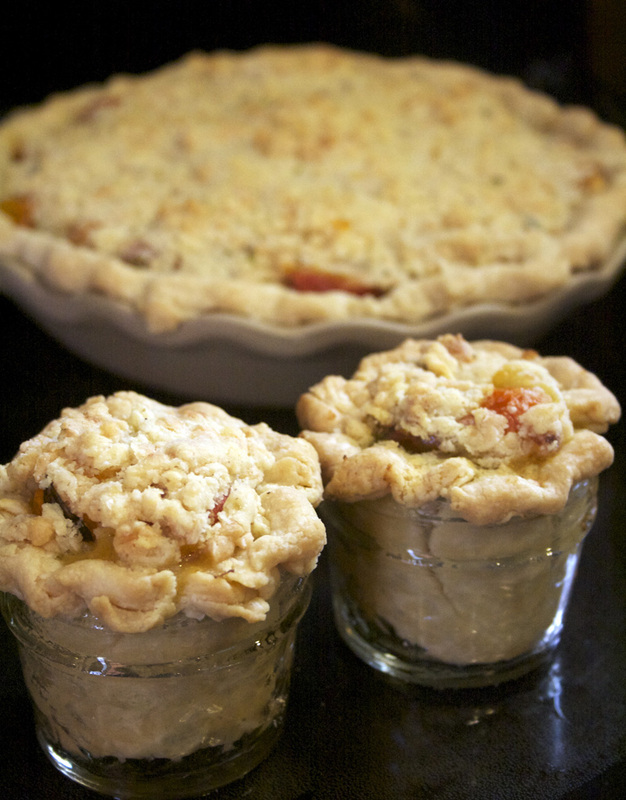 I will close with this recipe for Tomato Pie I made to take to a Tomato Sandwich Potluck a couple weeks back. Preheat oven to 375. Roll out the dough, form into a pie plate, and scallop the edges. Place in the freezer for about 10 minutes. I find this helps the edges keep their form a little better once you place the pie in the oven. 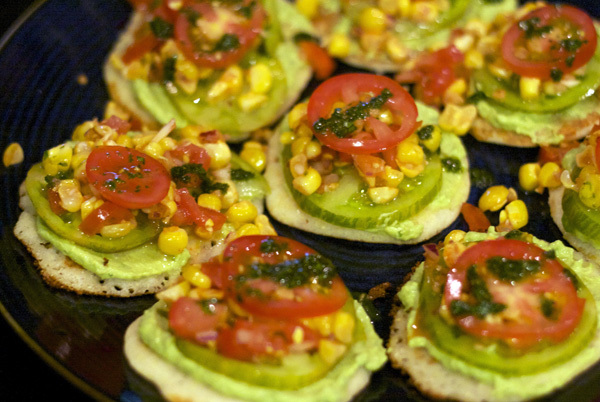 Cut the tomatoes in half (or if using larger ones, cut into smaller pieces) and mix with 2 Tbsp corn meal, salt, pepper, and chopped herbs. Place in pie shell. Mix the next few ingredients with your hands or a food processor to form crumbs and cover the tomatoes. Place the pie in the oven for 45 minutes to an hour, or until golden on top and the tomatoes have burst but are not too runny. I made mini ones in tiny Mason jars, too. 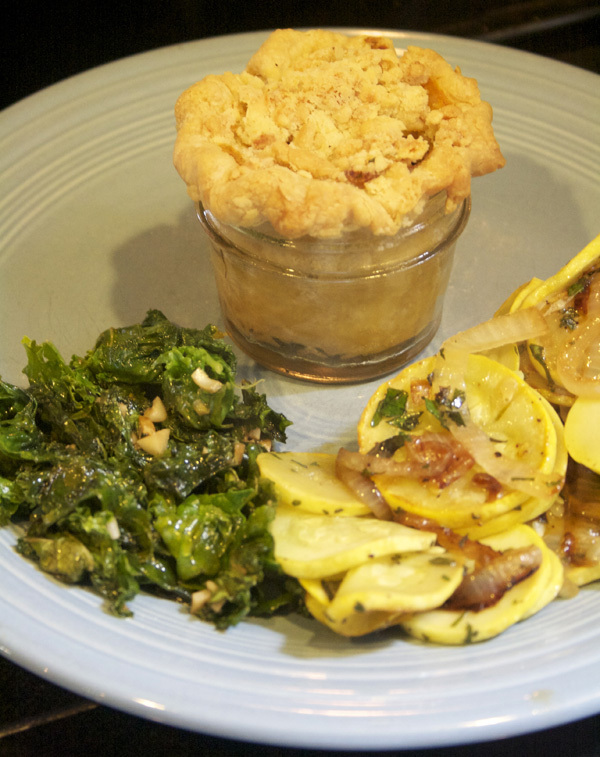 The little ones are great served as a side dish with some summer veggies! 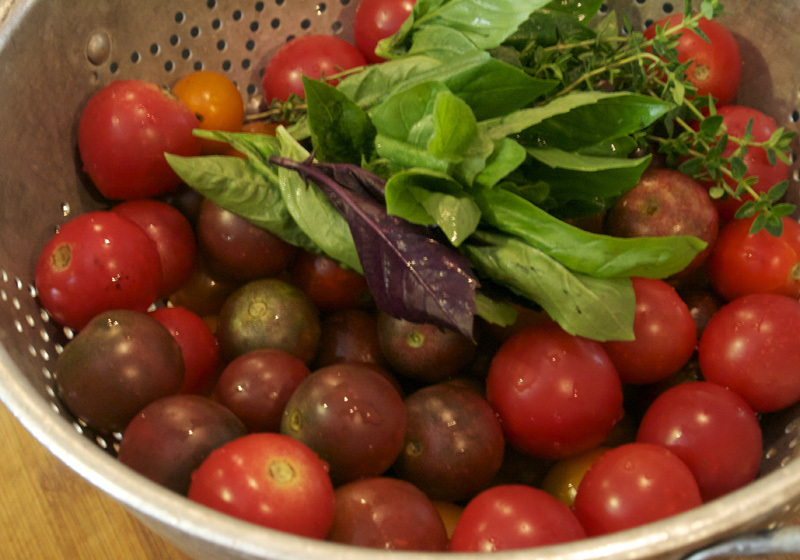 Enjoy the last of the summer crops!